ULTIMATE COMFORT: Imagine cold blistery snow and sleet hitting you…and a smile on your face. No problem, you say. Our stretchy, breathable fabric protects your face while wicking away moisture. The fleece lining retains heat. To prevent stuffiness, our balaclavas feature mesh breathing panels to increase airflow while minimizing condensation on your goggles. That’s why you’re smiling. The Tough Headwear Satisfaction Guarantee: If for any reason you’re not 100% satisfied with our headwear, just let us know. We’ll refund or replace your product faster than you can say “burrrrr”. How can we make this incredible guarantee? Because we’re outdoor adventurers from California who’ve tested our headwear in every condition possible. We never go on an adventure without our Tough Headwear, and we know you’ll love our balaclavas! 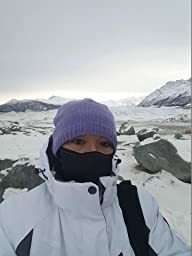 The fit was perfect and definitely kept my face/ears warm during out glacier walk in Alaska (could not have gone without it at -4 degrees). Don’t let the low price fool you. This is a quality, well-fitting, very well constructed product that fits as expected. I’m replacing my older Klim balaclava with this Tough Headwear piece at about 30% of the price of the Klim. 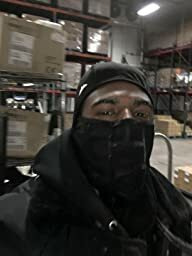 I have a huge XXL head, and the product fits very well and is comfortable alone or under my helmet, and provides good neck protection in the cold. It’s not the warmest option out there, but it does its job pretty well. Believe the reviews.